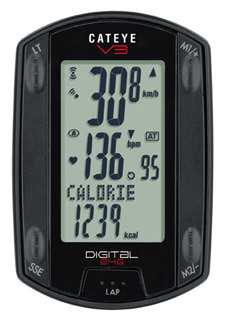 Cateye have created an affordable wireless cycle computer capable of processing speed, distance, heart rate and cadence information using cross talk free 2.4ghz digital wireless technology. The V3 clearly displays 4 readouts simutaneously. continue reading "Cateye V3 Triple Wireless Cycle Computer with Cadence and HRM"